If you're looking for a new sound that can be shared with gamers and non-gamers alike, the self-titled CD release from The String Arcade will definitely be music to your ears. It's a video game tribute album, meant to capture the essence of each video game theme and transfer it into an arrangement that gamers can relate to, and enjoyable for all. A lot of people imagine a string quartet as something only present at fancy soirees or expensive weddings, but in truth it's a gentler form of Classical music that can transition itself into many different types of audible delight. 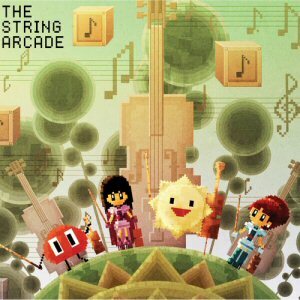 The String Arcade themes begin with a mischievous type of bouncy music (where one could envision little pixies hopping through tall grass and sneaking up on a lawn gnome), moving on to tango, then to music reminiscent of Arabian Nights, and finally to a grand adventure-themed sound. There is so much in this album that it's hard to believe it's devoid of percussion or brass, as the full, rich sound encompasses all the emotional depth of a full orchestra - even though it only includes a cello, a viola, and two violins! Many of the titles aren't what you'll see on most tribute artists soundtracks. We all know the drill: musicians have reworked and re-recorded many of the classics like Halo, Legend of Zelda, or Mario and presented their work in a very obvious fashion. While this can be very entertaining, The String Arcade decided to take a different route with some more subtle titles like Medicated Cow Walks the Cobbled Streets with Disgruntled Goat (Ravenshire Castle). Some of my personal favourites on the album are from games I (admittedly) haven't even played. Ferdinand Wanders Out for a Late Night Haircut (Pettington Park) is super cute, with quick-step strings that make it feel as if you truly were sneaking out in the middle of the night to steal the last cookie from the cookie jar. Secondly, I thoroughly enjoyed the exciting, tango-like Grasswalk song (Plants Vs. Zombies). It's almost as if you could see yourself dancing. Lastly, the Galaga theme Dance of the Space Bugs is an amazing rendition, though it is one of the more noticeable titles. It starts off sweet and slow, moving into joyous and exciting, and finishing with a bi, epic-adventure feeling. As far as guilty pleasures go, this is one that can be shared openly with friends and family of any age or personal taste. If the idea that you can pop in the CD and listen to it no matter who you're with isn't appealing enough, 100% of the sales are going right to the Alameda Music Project, a free after school K-5 program in Venezuela meant to teach music to children who may not otherwise have the option to learn. Making music so that younger generations can learn to love music as well, and doing it through a gaming-themed composition? You bet I can get behind that! The original Kickstarter campaign finished last August, and they have been going full steam ahead in an attempt to complete this album and release it to the general population. Produced by composer Dren McDonald (Skulls of the Shogun), The String Arcade is now available for digital download or hard copy via Amazon , Google Play, iTunes, LoudR.FM and BandCamp.